The Vigilant Citizen solves the mystery of the Israel Supreme Court: Why its price is secret. When you study those types of buildings, you quickly realize that the same themes inevitably reappear: illumination, pyramid, ascent, the number 13 or 33 , phallic/yonic symbols, etc. This building has it all and more. 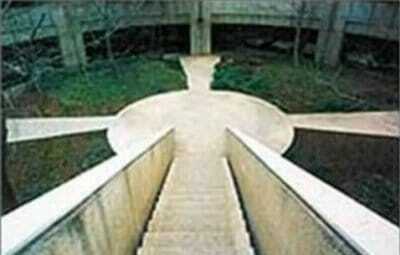 At the center of the parking facilities are pathways shaped like Christian cross. Jerry Golden has mentioned that this cross has been specifically placed to be trampled on by visitors. He is most probably right. In a building where spiritual symbolism reigns supreme, there are effectively little chances that the layout of those pathways haven’t been thoroughly thought out by the architects. In other words, this can’t be just a coincidence. The visitors have to go down the stairs – symbolically “descend” to lower spheres – to reach the cross. As you might have noticed, the importance of the act of ascending and descending in this building is very important. This is not an exception. Occult secret societies have historically been at odds with the Christian church who repeatedly persecuted and accused them of all sorts of heresies. During the Middle-Ages the Knights Templar (ancestors of Freemasonry) have been accused by the Archbishop of Canterbury of numerous anti-Christian deeds, including “trampling the Cross under foot” during their initiation processes. Are they poking back at Christianity with this symbol? You are currently browsing the Mystery Worshiper's Blog blog archives for July, 2014.